Just a short 5 miles to one of the most beautiful beaches in the world. Canoe & kayak access to Escambia Bay. Private saltwater fishing bridge, waterfront sites and private boat ramp. We called for an overnight stay. We got a call back within an hour. We arrived and were greeted with a warm and friendly lady. They directed us to the other side or the park across a bridge, and got a friendly spotter to help me back into the spot. We love this place, near the water with a stream running between, dividing the park. We were given a list of places to go eat on the shore (long drive) we opted to go closer to the park. Love seeing the Pelicans diving and such. Very clean, well kept sites, and dog walk. One would have to stay longer to really enjoy the things to do. We have stayed here before and enjoyed the park. Clean and a beautiful environment. Easy to get around the Pensacola area. Staff is friendly and helpful. Beautiful little park. Owner/managers very helpful and obviously proud of their park. We were in Avalon West backed up to the little lagoon. restrooms were spotless, laundry also spotless. Both are handicapped accessible). There were two individual shower/commode units that shared the laundry building. We were led to our site and guided into the site (it was a back-in and we were very close to the water). A great place for waterfowl viewing and fishing off the bridge that connects the east and west sides of the park. No traffic noise despite the park's proximity to I10. Shopping, restaurants and attractions within a few miles (Naval Air Museum at Pensacola and Blackwater River State Park, for example). We were given area maps and directions to attractions, restaurants, and shopping at check-in. Plenty of room for walking around and enjoying the area. We would definitely return. 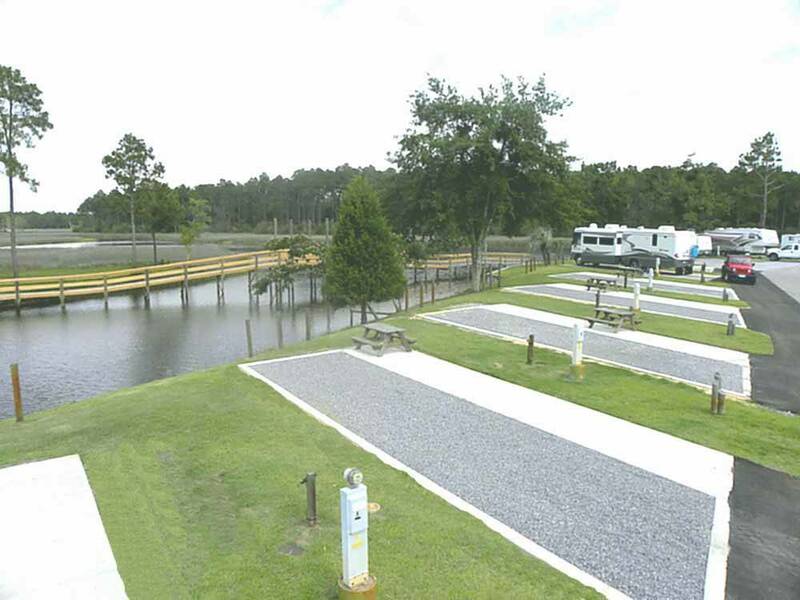 Great little RV park on a private canal where you can watch fish jumping and pelicans diving for meals. The WIFI was not great and was not secure but the cable was excellent and we were able to watch Superbowl without any issues. We would definitely go back if we're in the area again. Good overnight stop. Close to I-10 but no noise at all. Nice management, and helpful. Wi-Fi is a little weak but outside at the table it was good. We were parked on the west side portion of the park which seems to be the older part, the sites in the east side are a little nicer. Our site was back in, gravel pad with a patch of grass and picnic table. This site backs up to the highway so can be noisy. Full hookups, cable and WiFi are included. The bathrooms are clean and the park is well maintained. Service is terrific, as some reviewers have indicated, we were given very comprehensive information at check in regarding shopping, restaurants and attractions. Located just off I-10 on the east side of Escambia Bay. We paid $234 for the week before tax. We had a wonderful stay at this campground. Our site was on the water which provided us with a nice breeze the entire stay. Park is well maintained and people are very polite and very helpful with info needed to find local restaurants. Will definitely stay at this location again. Will recommend to any of my camping friends as well. One of the cleanest and neatest parks we have stayed at. the staff was very polite and helpful and the sites were very level, clean and generous sized. A short drive to Pensacola and Milton for shopping and good restaurants. Great place to stay. Very convenient and accessible. Very well maintained sites. Beautiful view of the waterways and woodlands. Our experience at this park was great, from the call to reserve to the managers this place is great. The park is very clean and well laid out. Lots of appeal on a private lagoon that is connected to the river. When you arrive you are greeted with a smile and lots of information about the area and attractions. You are then led to your spot and even got help backing it to the site as we were on the water. Lots to do in the area. We only stayed 2 nights as we were on our way through, but would have stayed longer if plans had allowed. The bath and laundry facilities were nice, well maintained and clean.